I’m kind of at a loss for words. The scene here at midnight is incredible, and I have a very narrow view of the city from my apartment. Most cities in the U.S. have laws against setting off fireworks within the city limits, except for organized events. It’s far from organized here in Santo Domingo, and there are no restrictive laws. I don’t think there are any limits on the firepower of these things either, and a pall of smoke is drifting across my view. The place is like a war zone! These are world-class fireworks, and they’re in the hands of ordinary citizens. Because of the noise and concussion, many automobile alarms are going off. Also, meringue music is being played all around on huge loudspeakers, and to top it off, there are some large thunderheads over the Caribbean showing off their own firepower. Really, it’s one of those memorable lifetime events, something not to be missed or forgotten. Also of note is that most places are closed tonight, such as bars (! ), pizza parlors and restaurants, whereas these same places were open on Christmas Eve. Seems to be just the reverse in the U.S.
It’s interesting, too, that the Muslim Hajj and Eid ul-Adha are also taking place at this time of year, and, of course, I send my best to all my Muslim friends, and may they have a blessed year, Inshallah. On a more pessimistic note, several bombs exploded in Bangkok, Thailand today. My heart goes out to the beautiful people there. What a sad thing to happen to this wonderful part of the world. May Buddha heal the hearts of those affected by this crap. Well, I’d better get to bed. I still have a bit of work to do tomorrow before leaving for Santiago on Tuesday for 3 or 4 days to conduct some workshops at the Instituto Superior de Agricultura. Happy New Year to all. More later. Still living in my apartment in Santo Domingo, I’ve discovered that if I set up my laptop in an exact position by my one, lone window, I can access the Internet through an open wireless connection from somewhere. I don’t know where it originates from, but it is somewhat reliable, somewhat strong. Nice. I picked up a few viruses from going to the local internet cafe, where I was downloading files to my memory stick. I would then come back to the apartment and plug the stick into my laptop, thereby transferring the virus. It seems, though, that my anti-virus programs picked up on the infections before they took root. However, if anyone gets any weird emails from me, delete them and accept my apologies. I think that everything is ok, though. Well, it’ll be another month until I return to my dream. In the meantime, though, I’ll be going north to Santiago on January 2nd to conduct a four-day workshop for the English teachers at the Agriculture Institute. I met the friendly folks there a few weeks ago and look forward to returning to impart what knowledge and resources I have. That’s the reason I haven’t posted in a while; I’ve been working on what I want to present to them. I’m not used to it, at least from my experiences in wintry Montana, but fireworks are a feature of Christmas and New Year celebrations here. My mom tells me that the Dallas/Fort Worth, Texas area, where my brother lives, is also heavy on the aerial show. It must be a warm-weather thing, I think, but if anyone knows of fireworks shows at the end of the year in cold-weather locations, please let me know. 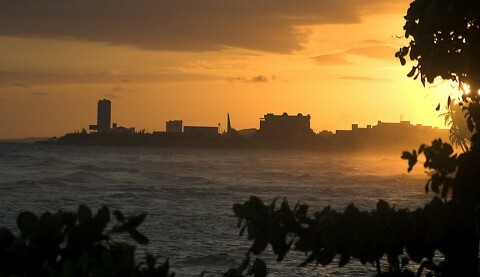 It’s about time I posted a few photos, so below is a shot taken on Christmas Eve, sunset along the Malecon. Enjoy, and a Happy and Healthy New Year to all. More later. It was interesting to get out of the Santo Domingo area and head north to Santiago. The trip takes about two hours as the bus journeys through the green foothills of the Cordillera Central. To the west, the cloud-clogged peaks loomed over orange groves, pastures and croplands–this is the breadbasket of the Dominican Republic. Santiago itself has about 500,000 people, and it seems much more tranquil than Santo Domingo, which Forbes Magazine named one of the world’s ten densest cities, citing in particular the terrible traffic. The Instituto Superior Agricultura (ISA) lies on a beautiful campus. Since the 700 or so ag students need experience and research opportunities, the institute has many crops, animals and flowering plants. The buildings seem fairly new and are interspaced with luxurious, well-maintained grounds. ISA has ambitious plans to diversify the student population, opening up majors in business, engineering and technology. They hope to expand from 700 to 10,000 students over the next 10 years and want to make the English program an important part of that expansion. I’ll be staying there from Jan. 2 through the 5th, conducting a series of workshops for the few English teachers. It should be a nice relief from SD. The Forbes article doesn’t lie about the traffic; it’s horrendous. On the return trip the skies opened just outside of the capital, a torrential downpour flooding the streets. On top of that it was during rush hour, and it took the bus 30 minutes to travel about 4 or 5 miles. It kind of reminded me of the huge jams in Seoul, Korea, which was also cited in the article. Two more days until Christmas. I was going to buy a Butterball turkey breast, but I don’t feel like shelling out $20, so I’ll probably fix up some chicken breasts, mashed potatoes, gravy, peas and dinner rolls (I’m a traditionalist when it comes to Thanksgiving and Christmas dinners) in my tiny kitchenette; luckily, it includes a fair-sized oven. I won’t be able to post again until after Monday, so once again, Happy Holiday to everyone, whether it be Christmas or Hannukah or Winter Solstice or whatever you might celebrate this time of year. More later. Not much to report lately. Tomorrow I’m traveling to Santiago, in the northern part of the country, to talk to folks from the Agriculture Institute about setting up an English program, something they really want to push. I’m going to the bus station right after posting this to buy the ticket. It’s about a 1 1/2 hour ride, not too bad, and Rex told me that the bus system is very good, very modern. I’m coming back on the same day, around 7 at night. Then, it’s a 4-day holiday, more or less, with Christmas coming up. I’ll probably take a few strolls along the Malecon and maybe spend some time in the old Colonial Zone. I want to take some photos, something I haven’t done in a while. In the meantime, Merry Christmas to everyone. My first workshop turned out ok, so I’m pretty free until next Thursday, when I’ve been scheduled to go to the Agricultural Institute up in Santiago to talk to one of the officials there about instituting an English Language Program at their facility. If I can swing it, I might try to make reservations for several days afterward at one of the resorts a little further up on the coast. That would be a fun place to spend Christmas! It depends on whether I can get a reservation and on the price. Rex Moser and Ana Maria, his secretary, told me that this time of year is the “low” season for tourists, and getting a reservation and a good price shouldn’t be a problem. Seems that everyone wants to stay home for the holidays. The Univ. of Montana Griz football team lost in the semifinal game of the National Championship, 19-17 to some team from Massachusetts. Too bad. More later. As expected, Rex found a lot of projects for me to work on. First off, this coming Thursday, I’ll be doing a workshop/presentation for teachers at the Dominican/American Cultural Institute (ICDA). The presentation will cover how to enhance students’ oral skills. At some time before the New Year, hopefully, I’ll be going up to Santiago to help the Agriculture Institute implement their new English language programs. I’ll probably stay there for a week, conducting training sessions. From there, I might take a few days off and go to Puerto Plata, one of the resort areas near Santiago. Fun in the sun! I’m also going to visit a non-government organization (NGO) here in Santo Domingo to check into their English program. They’re seeking funds from the Embassy and Rex wants me to check them for legitimacy. In January, I’ll be doing a week-long workshop at UASD for their English department, helping them to get up to snuff on the latest teaching methodologies and evaluation/assessment techniques. In addition, I want to do some work on teaching materials I’ll be using when the baseball camp reopens in February. Whew! A bit busy, but nothing overwhelming. I was invited to the Embassy’s Public Affairs Section staff party at Bill Millman’s house Friday night and got to meet a few people I hadn’t run into before. It was a pot luck (I was told to just bring myself) and everyone had a good time. For the last 3 years, in Korea and Morocco, it just hasn’t seemed like Christmas around this time of year. Morocco, a Muslim nation, had very little in the way of holiday decorations, music, and the other trappings of this time of year, and Korea, though about 50% Christian, didn’t seem to have the festive spirit that’s found back home. Santo Domingo, though, is awash in Christmas lights, the stores are bedecked in displays enticing shoppers to buy their wares for Christmas gifts, and the people are in a holiday mood. It seems much more like Christmas this year than it has in a while, for me. Except there’s no snow and cold. I definitely don’t miss the weather. More later. I forgot how noisy and hot Santo Domingo is. Noisy from the traffic and hot from the concrete soaking up the heat, although, right now, the first part of December, it is not as hot as it probably is in the middle of summer. Compared to the campus, though, it seems much warmer. I miss the Yankee camp already, the peaceful quiet, the beautiful landscape, the players and coaches–everything. I hope the two months go by quickly. I have to meet with Rex, the Cultural Affairs Officer at the Embassy, tomorrow. He emailed me and said that we have LOTS to talk about. Nothing serious, I hope; I imagine he has more than a few assignments for me. That’s ok–keep me busy and the faster that time goes by. I’ll be back in Yankeeland in no time. I took a walk along the Malecon today, as is my Sunday habit. Wow, was it busy. I stayed later than usual, past sundown, and it seemed that half of SD was there. However, I think it must have been a special day, like a National Holiday or something, because very large stages were set up at both ends of the closed-to-traffic avenue, something I’ve not seen before, and music groups were performing. I sat on one of the benches about halfway down the area, sipping on a cold drink, when a very large batting cage, drawn by a truck and enclosed with netting, pulled up. Sponsored by Presidente Beer and featuring VERY large speakers playing salsa or merengue music (I don’t know the difference), it offered folks a chance to take a swing at a pitching-machine-thrown baseball, with the reward of beer for doing well. I’m not sure what the sponsors said that the criteria was for winning a beer, since my Spanish is not quite that good yet, but many hombres (and chicas) gave it a swing. It was a good time for all. I’m not that keen on walking around at night, no matter where I’m at. I’m very cautious and aware of people who might not have my best interests in mind. But, walking the 1 1/2 – 2 miles back to my apartment doesn’t seem to be a problem. I just have to be sure to walk back on the main thoroughfares, the ones with lots of other people or traffic. No problem. I wouldn’t walk at one or two in the morning, but, then again, there’s no reason I would be walking at that time of night. I’ve been warned by the Embassy to be careful, but, so far, I’ve never had a problem getting around. You just have to use a bit of common sense and caution to be ok. More later.